On many occasions, people complain about their teeth looking dirty despite brushing it twice on a daily basis. As an accompaniment to these complaints, patients also have Bad Breath, Bleeding Gums and later they realise the development of cavities, accompanied with the fact of having a severe toothache. But this problem is not something that has developed overnight, in fact, it is a result of neglecting dental issues over time, due to the many reasons one can conjure up. IT Professions spend most of their time working on the job, mostly on their desks or travelling out for different professional purposes. During this time, as IT Professionals are prone to spend more and more time thinking and working hard on their jobs, they tend to adopt a lifestyle, especially with food habits, that they forget about health and their subsequent routine. Eating different items, healthy food, junk food, soft drinks or anything that over time could severely affect their dental layout, but ignoring the cleaning and checking of their teeth often costs them over time. As work becomes the most crucial aspect of their lives, dental health among other issues of their body and mind takes a backseat. Often it is found that many patients, especially in the case of IT professions tend to carry a doubt that they might hear the bad news about their dental health the moment they get their teeth checked up. This fear that they might have a terrible dental set up in their mouth often makes them stay away from dentists. But this is a psychological problem, which grips IT professionals or people in general and keeps them away from check-ups and subsequently leading to a slow, but steady Decay of Their Teeth. While dental work may not be a cheap option from one’s perspective, it’s an essential need if one wishes to protect their dental health in the long run. Costing is one such factor that tends to keep people away from the dentists, despite people like IT Professionals, at least in most parts having enrolled for dental insurance. The idea of dental work being a costly affair is a fact but had the concerned patient made earlier visits and had they kept their teeth healthy, the overall cost of dental work in the long term would have been neglectable. It is a common understanding that having regular dental check-ups will save time in the future. Dental work is something one has to follow promptly, but in cases of IT professionals, time has always been an issue. Many IT Professionals tend to neglect dental check-ups for fear they might have to get a procedure done there or spend more time in follow-ups. It is common among IT professionals to be busy for most of the week, and they tend to unwind during the weekends or on their days off, leading to dental checkups becoming a secondary issue. Regular checks will keep dental health in check, while in the long run often helping in avoid any procedures, unless necessary. In short, considering the lifestyle and time constraints of many IT professionals, they tend to be busy and lazy at the same time, and thus letting their dental health suffer. An anxiety problem with going and speaking to the dentist is not only restricted to IT professionals, but to many people who might require a proper dental check-up. Dental anxiety is nothing but the fear of expressing the problems to your dentist. 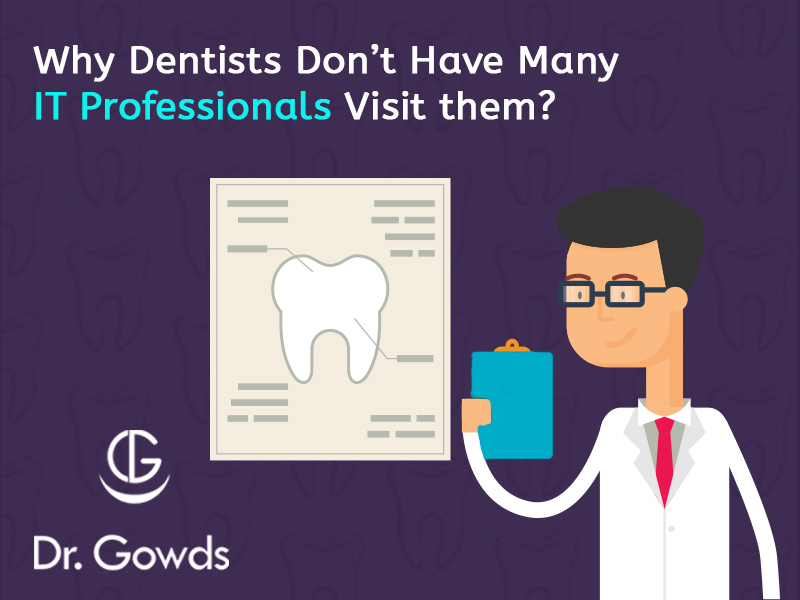 IT Professionals for the many reasons mentioned in the points above do not open up to their dentists, with worries of costs, time constraints etc. Many people, including IT professionals, do not want to be advised by their dentists for habits which are associated with their lifestyle choices. But as a word of advice, it is essential your dentist knows about your problems about your teeth and often hiding those problems fearing severe aftermath could only make way for more, prolonged problems in the long run. IT Professional or not, people often shy away from the dentist’s clinic for many other reasons. Dental health is very vulnerable, as it belongs in the first line of attack from germs or plaque when we eat and eating is essential as well as a daily, mandatory activity. Some people might be extra careful as to what they eat, but at times it’s even beyond their control. But the important word of advice would be to keep the checkups going on regularly to avoid more severe, long-term problems in the future. Specialist in Orthodontics & Dentofacial Orthodontics (Switzerland), Specialist in Orthodontics & Dentofacial Orthodontics (Switzerland). Chairman & CEO of Dr. Gowds Dental Hospital. If there had to be someone who can take credit for lakhs of smiling faces in Hyderabad, theres one person whos claim to fame it can be – Prof. Dr. Snigdha Gowd. Its the joy of making people smile without inhibitions that made her choose the field of dentistry over her other passions. This art and skill of creating beautiful smiles is in her genes. Spearheading Dr.Gowds Dental Hospitals in Hyderabad, her idea behind transforming lives through corrected smiles and beautiful teeth is just a part of the bigger picture.